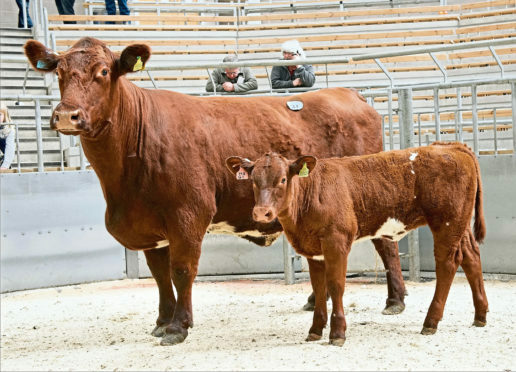 A new breed record for a Beef Shorthorn cow and calf was set at the second part of the dispersal sale of Douglas McMillan’s Perthshire-based Coldrochie herd. The record priced lot, selling for 16,000gn at United Auctions in Stirling, was five-year-old Coldrochie Broadhooks G1 and her February-born heifer calf Coldrochie Broadhooks M8 at foot. The cow, which has had a successful show career to date, is by Chapelton Winsome, and her calf is by Fearn Godfather. She sold to the Green family, which runs the well-known Corskie herd of Simmentals at Corskie Farm, Garmouth, Fochabers. Laura Green said she joins two Coldrochie heifers, and their February-born heifer calves, which were bought at the first part of the dispersal sale in February. The family’s Shorthorn herd will also carry the Corskie prefix. Other leading female prices at the sale included 8,000gn for seven-year-old Coldrochie Broadhooks D34, by LS Zeus, and her March-born bull calf, by Fearn Godfather, at foot. The pair sold to the Smith family, which runs the Drumsleed Simmental herd at Drumsleed, Fordoun, Laurencekirk. Another cow and calf outfit at 8,000gn sold to a very active buyer at the sale – Thistledown Cowford Farms, of Bankfoot, Perthshire. This was September-2014 born Coldrochie Augusta Blossom H49, by Chapelton Winsome, and her March-born heifer calf, also by Fearn Godfather, named Coldrochie Augusta Blossom M22. Thistledown bought several other leading priced lots. This included paying 7,500gn for yearling heifer Coldrochie Augusta Blossom L8, by Fearn Godfather, and 7,000gn for two cow and calf outfits. The first was March-2016 born Coldrochie Secret Swift K17 and her heifer calf, and the second was September-2014 born Coldrochie Princess Royal H47 and her heifer calf. Other sale toppers included 6,500gn for two-year-old Coldrochie Grace Beauty K16 and her bull calf, selling to Strathisla Farms, Moolies, Ruthven, Blairgowrie. Bulls topped at 9,000gn for November-2015 born Lintonpriory Victor. An ET son of CCS Equity’s Charmer, out of HC Myrtle BO 50L, he sold to J & J Fry, Well Farm, Billinghurst, West Sussex.